Remember that whole 'weave a scarf every month in 2014' thing I was going for? The idea was to end up with at least 11 Christmas gifts ready and gorgeous. But if I've got this straight, I wove three scarves in three months and gave them all away, then wove one scarf in three months and gave it away, and then there was the June scarf. Which looks like this at the moment. 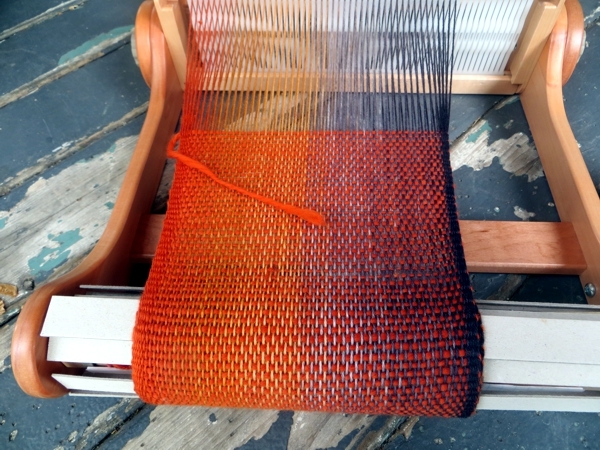 There is still quite a bit yet to weave - which is to say, I could have it done in thirty minutes if I sat down and did it. And I plan to, unless something disastrous happens. Or something shiny. Apparently I'm easily distracted. b/ me shoving at the loom on the china hutch and thinking Gah! must make space for these books / piles of yarn / other odds and ends. 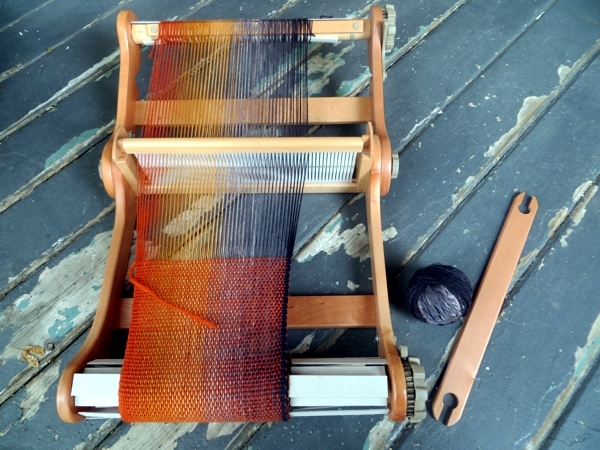 Then on Tuesday night after going for an emergency walk to clear my head I sat down with the loom and put in maybe ninety minutes and got to where I am now. I was too tired to think of joining on a new lump of yarn at that point so I stopped, but I was terribly impressed by the fact that effort = results. Surprised, even. ... and since I have some time off today, I plan to put it to good use. 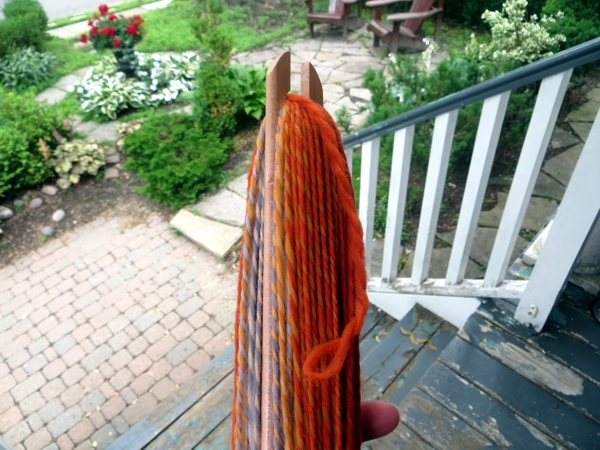 I finished The Girl You Left Behind as I ran out of yarn for the last bit of weaving, and the book I started yesterday - so dull I can't actually remember the title - has borrowed the setup of The Shootist and gone downhill from there. Need. Replacement. Do I dare buy a copy of The Shining, the better to appreciate a possible sit-down with Dr. Sleep? I don't usually opt for Stephen King because hello: Scary, but he sure can tell a riveting story and I'm rationing the other authors I know I can count on for those. Maybe this is the day to listen to Carol Burnett. Hope your decisions today are a lot less apt to put you into quaking boots, and I'll see you tomorrow!